Since we’ve been there and we know what it’s like, we decided to help and round up 101 four and five ingredient recipes for you! The best part is they are ALL freezer-friendly so you can plan a cooking day and hopefully won’t end up hopeless in the kitchen with a glass of wine! Make a Menu and Meal Plan With These Recipes! With membership, you have access to all our recipes (including these!) and ALL our menus! You can customize one of our already curated menus, or create your own from scratch using our blank menu, My Freezer Meal Plan! You could even use this list to make a 4/5 ingredient menu! 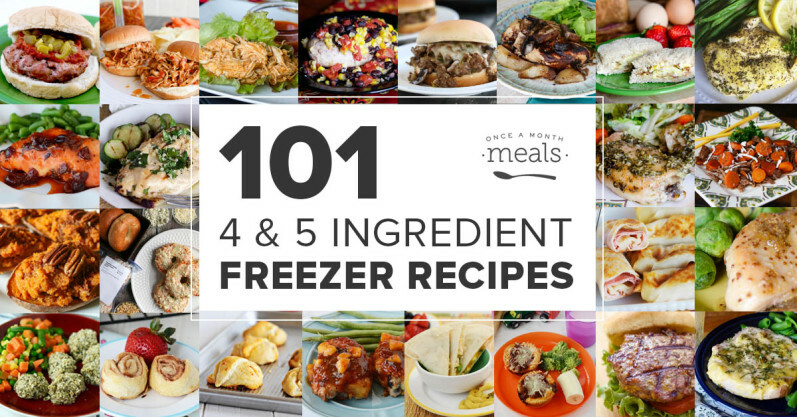 Check out all 101 Four and Five Ingredient Freezer Meal Recipes! Please note: We did not count salt, pepper, or water as an ingredient!